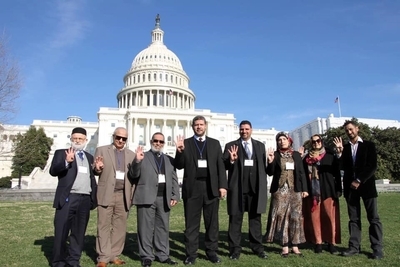 Participants in an EAFJ-organized lobbying trip flash the pro-Muslim Brotherhood gesture outside the Capitol Monday. Muslim Brotherhood supporters from the New York-New Jersey area lobbied members of Congress Monday to ask them to pressure Egypt about its execution of political opponents. The event piggybacked on a broader Muslim Advocacy Day organized by the U.S. Council of Muslim Organizations. The USCMO is an umbrella organization that includes the major American Islamist organizations including the Council on American Islamic Relations (CAIR), the Muslim American Society, American Muslims for Palestine (AMP) and the Islamic Circle of North America (ICNA) among others. A delegation organized by Egyptian Americans for Freedom and Justice (EAFJ) visited the offices of New York Democrats Hakeem Jeffries, Paul Tonko, and Nita Lowey, along with Rashida Tlaib, D-Mich., Jan Shakowsky, D-Ill. and Rick Allen, R-Ga. They also visited the Democratic-controlled House Foreign Affairs Committee office. It is unclear how much the representatives know about the EAFJ and the contents of any discussions are not know. Attempts to reach these offices for comment were unsuccessful. More than 2,000 people are on Egypt's death row, and 86 people have been executed since 2014, according to data collected by Cornell Law School. Many of these people have been linked to the Muslim Brotherhood. EAFJ was created by Muslim Brotherhood supporters in the United States following the Egyptian military's 2013 ouster of former President Mohamed Morsi. Its aim is to restore the Muslim Brotherhood to power in Egypt. EAFJ President Hani Elkadi led the delegation, which marks the third year in a row the group has lobbied on Capitol Hill. He regularly posts Muslim Brotherhood symbols and messages on his Facebook feed, such as a March 10 graphic with the Brotherhood's symbol next to an image of its founder Hassan al-Banna. "I am [Muslim] Brotherhood and I'm not threatened," he wrote in 2015. Elkadi has supported Brotherhood-linked terrorists and terrorist acts in Egypt. In October 2016, he posted a memoriam for Muslim Brotherhood Guidance Bureau member Mohamed Kamal. Kamal built a Brotherhood terrorist infrastructure following the military's 2013 toppling of Egyptian President Mohamed Morsi's Brotherhood-dominated government. Hassm and Liwa al-Thawra, two groups which evolved from Kamal's infrastructure, appear on the State Department's list of foreign terrorist organizations. Elkadi denounced the killing of Kamal in a shootout with Egyptian authorities as an "assassination" carried out by "coup criminals" and used the hashtag "#Kamalmartyrs." Elkadi encouraged Egyptian youth to wage jihad against the military government in a November 2016 post. "A question to all young people against the bloody military coup. If the summons of jihad calls you to live for jihad, live for success. Are you ready for the call? ... Will we find one who brings his money or half for the expenses of jihad? Will we see one who leaves everything and lines up in the ranks of the Mujahidin?" Elkadi wrote. Other EAFJ members involved in the lobby effort also have supported terrorists. For example, after 1993 World Trade Center bombing mastermind Sheikh Omar Abdel Rahman died in 2017, Said Abbasy prayed that "God take vengeance on those who wronged him." Abbasy is a regular participant in EAFJ activities and often appears in photos on Facebook with the group's leaders. EAFJ member Fouad Rasheed, who helped plan the lobbying effort, posted an image in 2014 showing Hamas terrorists giving sweets to children. It cast them as heroic defenders of the "borders of the homeland" from the "Zionists." Rasheed posted a Popular Resistance Movement (PRM) communiqué announcing a firebombing in February 2015. The PRM was a terrorist group created by Kamal following Morsi's ouster. Eman Farid, who participated in the organizational meeting and the lobbying effort, posted a PRM communiqué on her Facebook page in January 2015 announcing that the group would only target "the militias of the coup." Farid also posted a photo of a car bombing carried out by the PRM in June 2015 that destroyed cars belonging to a Coptic businessman and his daughter. EAFJ members present themselves as human rights supporters in public while privately supporting terrorist acts and concealing them in Arabic-language Facebook posts.